APPRECIATING THE POS SOFTWARE HELP DESK APPRECIATION | A blog about smart POS software for independent small businesses. Thank you for taking my call on a Saturday. I know it was not urgent but you have relieved my stress. This email from a Tower systems POS software customer this morning is a thrill. They were stressed about information in a report and wanted to understand the context. We provided this and put their mind at rest. Indeed, the discussion has helped them see a new opportunity for their business. We love feedback like this. Change is the order of the day for retail as it has been since the first shops opened. What is different in 2016 is that the pace of change has picked up. Indeed, the pace of change today is greater than at any time in the past. Technology is playing a key role in that: online and offline technology is facilitating, pushing and even forcing change. Staying up to date is a challenge, especially in small and independent retailer businesses where having the time and resources to stay open can be difficult. Tower Systems tries to insulate its customers from some of the challenges of change by leveraging changes in the software without needing to change hardware infrastructure. In software updates we bring to the businesses of our customers tools and resources they can use to be more competitive. Tools and facilities through which they can enhance the relevance of their businesses in a changing retail landscape. We think and work strategically on such technical changes, always thinking about what we can do to help our customers drive their relevance for we know if you customers feel more relevant and are more successful as a result of our software then a need of our business plan is satisfied. What we do is more than about the software though. Enhancing our POS software is only part of what we do. The even more important aspect of helping our small business retailers compete is how we communicate with them about the enhancements. Our live training workshops, regional user meetings, training videos, advice sheets, personal training and other touch points help our customers learn about and embrace opportunities for change in their retail businesses through what we deliver in our POS software. In our latest work we have helped retailers redefine the over the counter sales experience, leveraging important touch points, driving value from shopper engagement. For retailers, changes like these are money in the bank. Our work directly linking with Magento, Shopify, Xero and other respected and widely used platforms is an example of us delivering on our commitment to help our small business retail community to embrace change and leverage change for their commercial success. 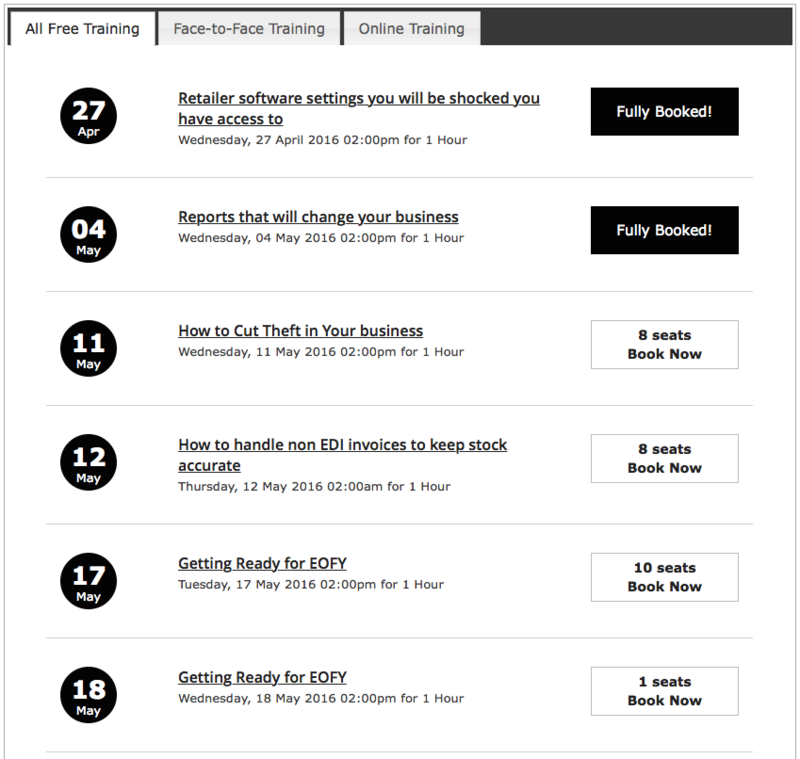 We love seeing this on our free POS software training booking page: a practical business management session for retailers FULLY BOOKED. We love it because this will be another group of retailers we help fall in love with practical outcomes they can leverage from their Tower Systems software. Each of our weekly training sessions has 15 participants – to provide everyone with time necessary for questions and discussion. The continued strong bookings for all our free raining sessions are appreciated by all of us at Tower Systems. We are grateful for the support. Tower Systems is proud to offer specialist software for independent pet and produce stores, software tailored to the needs of pet stores and software tailored to the needs of produce stores, software for independent retailers and not mass or chains. Tower Systems is an Australian software company that develops, sells and supports software for selected specialty marketplaces including pet and produce businesses. We only serve independent retail businesses. Our mission is to help retailers run more successful businesses. Our definition of success is a business that is making money, where the owners and employees enjoy what they do and where suppliers enjoy transacting. Good software can play an important role in nurturing business success as it sits at the heart of the business: transacting sales, managing stock, tracking customer activity and shining a light on business opportunities. Easy selling by weight with professional scale integration. Seamless transfer of sales and invoice data to Xero or MYOB. Security over business settings blocking changes that could compromise the business. We have excellent reference sites that can speak to our achievements for their businesses and our living up to the sales pitch of providing easy to use professional software built for purpose in these two specialist retail channels. Tower Systems offers help, advice and assistance beyond traditional POS software support and has done for many years. Our small business retail management advice is fresh and developed from our own hands-on retail experiences and from suggestions from our helpful customers. Each article of advice is jargon-free and accompanied by how-to steps and practice advice any retailer in any situation can read and use. Here are topics we have published advice for our customers on in recent months. How to confront feeling overwhelmed in your retail business. Gift certificates – for selling when you don’t have the gift a customer wants. How to stop price comparisons with major retailers in your retail business. How to cut shopper theft in your retail business. How to protect your business from a ransomware attack. Don’t be bound by what is usual for your type of retail business. Make every day your pay day. Leveraging what sells with what in your retail business. What manual processes can you eliminate in your business? 5 Rules Every Small Business Retailer Needs For The Sales Counter. 5 Ways small business retailers can market for free. How to cut mistakes in your retail business. How to be more local in your retail business. How to find optimism in your retail business. How to check prices using your Tower software. How to develop your unique selling proposition and why you need one. Competing against your most important competitor. How and when to quit stock in your retail business. How to transact if your computer system is down. How to cut employee theft in your retail business. 30 free marketing ideas for small business retailers this Christmas. This is a small sample of the advice from us and available to our POS software customers through our searchable and accessible from anywhere Knowledge Base. Presales of hot licence items – get revenue before a product is released. Reordering based on accurate sales data – reducing the cost of dead stock. Magento and Shopify interfaces – connect to your website easily. EFTPOS integration – save on a phone line and cut mistakes. There are many ways toy shop retailers can use this toy shop software to help you personalise the shopping experience with you, ways that make comparing your business to mass market toy retailers difficult. 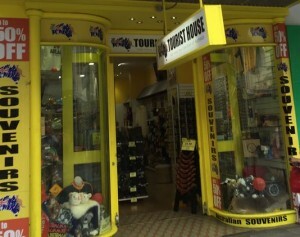 We help Toy retailers shine a light on their point of difference. For example, you can have product use and care information included automatically on receipts. This can be information you have written that sets your business apart from others. By product licence such as Star Wars, Batman etc. We believe in the value of accurate business data for small and independent retailers. Good data easily accessed can guide better quality business decisions – we see this every day in our extensive work with small business retailers across multiple channels. Here is the latest round of free POS software training Tower Systems is proud to offer its customers. Each one of these sessions is free to access, live and genuinely interactive. We publish the list here as proof of us living up to our word of offering free on-going training. 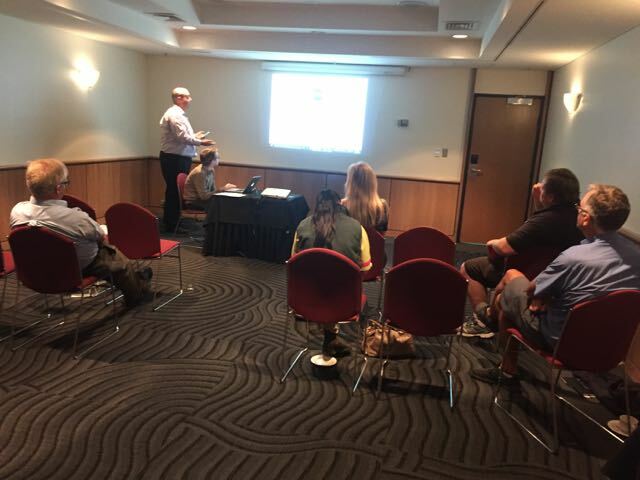 Our customers can book any time online through our live training portal – another self-serve facility offered by Tower Systems to its customers. 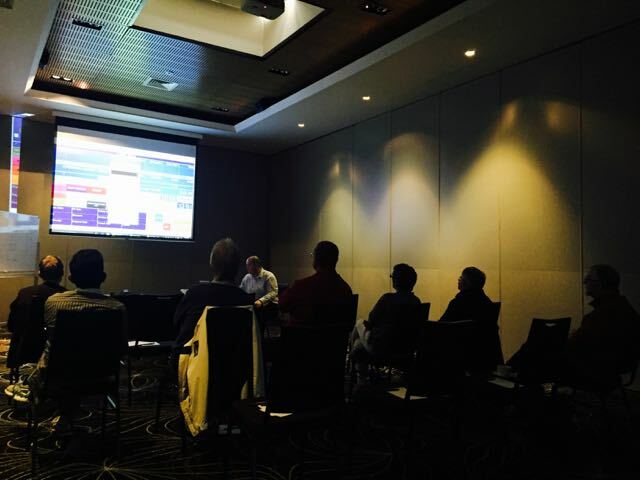 For a full list of free live POS software training, check out our website. From there you can book, see the topics, see the detail of what will be covered and add the event to your online calendar. 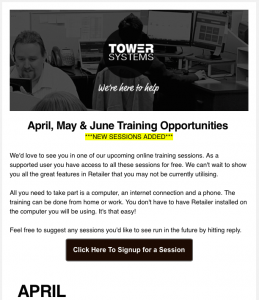 Smart software training bookings, another Tower AdvantageTM. All Tower Systems are closed today out of respect for ANZAC day. We are back on deck tomorrow at 7am AEST. In the meantime, all our after hours and management escalation numbers are live. This is why we work hard to encode the ability to focus on customer service in our Point of Sale software. That’s right, retailers using our software have touch points they can leverage using software which help deliver the kind of memorable customer service we are talking about here. Memorable customer service in retail, just as in a software company, is experiences which exceed expectations, it delivers benefits outside of what you expect even from a good business. In our IT company we compete with big IT companies and small, like us, IT companies. While we want our software to be the point of difference customers notice and talk about positively, it is our customer service which is loved and mentioned to colleagues more. Realising this was an epiphany for us. Thanks to relationships developed in the US with the Magento team over years, Tower Systems offers a best-practice solution, one powerful, easy to use and ideal for independent retail businesses. Linking directly with the Tower POS software it is a breeze to use – as the many e-commerce sites already using it can attest. A weakness we have seen in some other products is their use of an old version of Magento. By using the latest release, we are able to deliver something far more useful and valuable to small business retailers. Indeed, we can show the difference live through sites we have developed even for our business retail and e-commerce businesses. This use ourselves of our own software enables us to speak with experience and authority on these things. We are not selling you something thinking how it should work. No, we are selling something we use ourselves for our own retail business, something that meets our own exacting needs, something of which we are most proud. Using our Magento link it is easy to share data, images and other vital content between your shop and your online store without extra time or technology overhead. The Tower Systems approach is a breeze to implement and manage. We were asked recently to explain our mission in a way small business retailers not familiar with technology will understand. 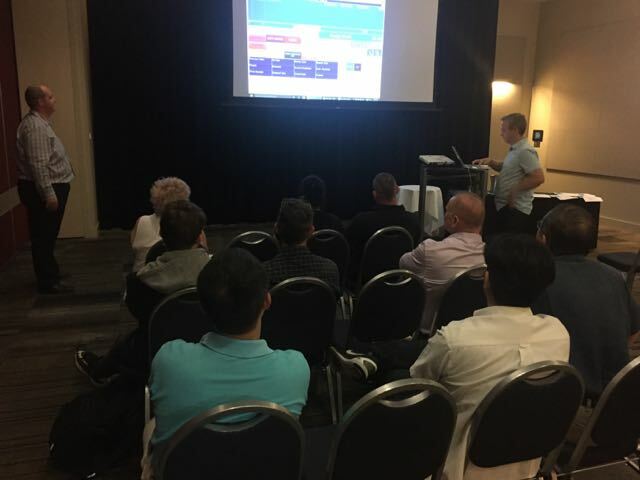 Tower Systems is an Australian POS software company that develops, sells and supports software for selected specialty marketplaces. What makes us different is how we engage. We go beyond what is traditional software company. We welcome working with your suppliers to create data links that save you and them time, data links that improve data accuracy, data links that feed more accurate business reports. We provide business insights based on data cultivated through the software – to business owners who ask. This is a free service. Our help desk provides context for advice. Rather than the turn it off and turn it on advice, our help desk team members explain the why, why from a business perspective the advice they are providing matters. Our software updates contain enhancements suggested and voted on by customers. You can have a direct say in the evolution of the software. Our communication is in plain English. While we are a company of IT geeks, when talking with customers we keep it simple. We know technology scares people. We don’t want it to scare our customers. We are accessible. You get to talk with real people all the time, including our leadership team. We love hearing POS software stories, stories from our small business retailer customers on how they are using our Point of Sale software to help their businesses in the service of their customers. 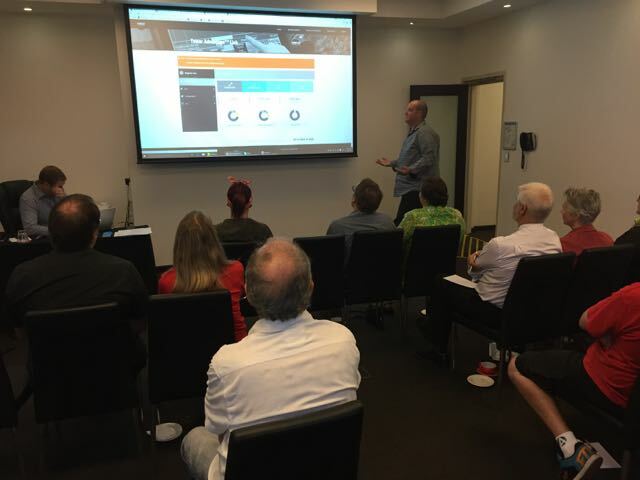 We heard one such success story from the folks at Tourist House recently, at one of our user meetings, on their use of our proprietary discount voucher loyalty software facilities to help their customers save on purchases tourist items from them. Using the software in four retail locations in four cities, the POS software sits at the heart of the operation. The discount voucher facilities have proved to be terrific in helping with employee and customer engagement. The stories of engagement have helped us understand from a real world perspective how our software can be used in a range of situations to drive better business outcomes. Every feedback story adds to our knowledge and the narrative of Tower Systems. We are grateful for customer engagement like this. It puts wind in our sales, a spring in our step. 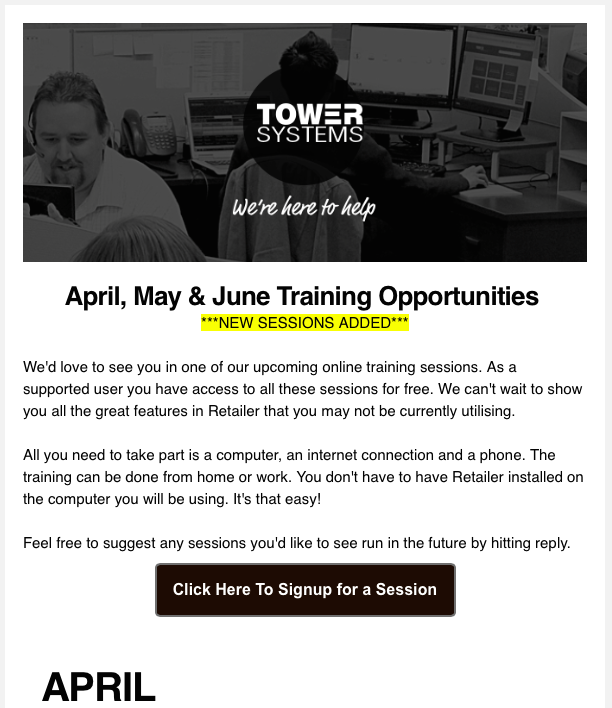 Tower Systems emailed its POS software customers today with news of additional free training opportunities. In addition to the weekly free live and interactive training workshops, the company announced additional sessions because some upcoming sessions are already full. We make sign up easy with a direct link from the email. In fact, sign up is as easy as using the software itself and accessing our help desk. We embrace every opportunity possible to show engaging with good technology can be easy. We are grateful to our customers for their support and love being able to serve them with this bonus training now on offer. 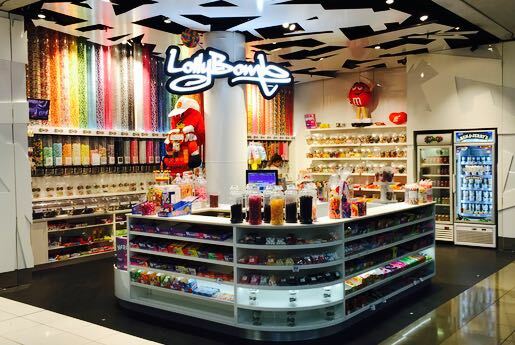 The seamless scale integration facilities in the Tower Systems POS software make selling easy in a range of specialty retailers including pet stores, garden centres, jewellers, whole foods stores and confectionery stores. Helping retailers sell by weight helps them drive fast and accurate selling. It can also offer retailers greater flexibility in pricing structure. All of which helps small and independent retailers to compete more successfully and effectively. 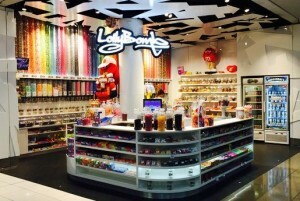 The terrific LollyBomb store in the heart of Adelaide is a good example of a smart retailer leveraging the scale facilities in the software to help run a more successful business. Selling by weight is easy thanks to the facilities in the software that were developed by Tower Systems in close consultation with retailers. This is another niche service handled by the Tower software, making it a genuinely beneficial tool for niche and special interest small business retailers. Integrations are important to small business retailers. They can often set POS software companies apart in that not all integrations are approved. take Xero, for example – they do not approve all POS software requests for integration. They have a structured process to follow. This is why being approved is a badge of honour and an important differentiator. 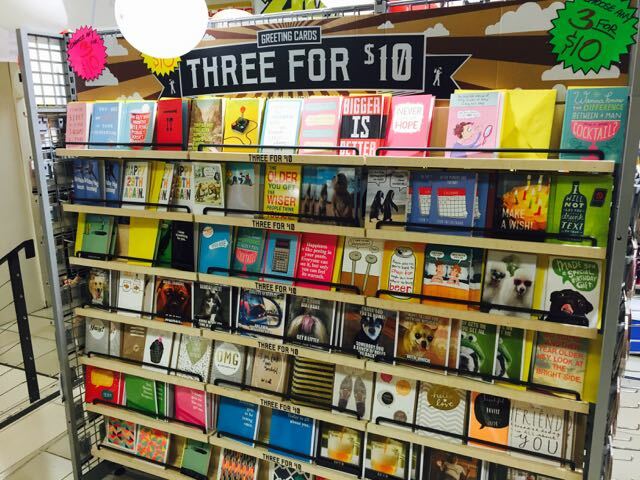 Retailers using the Tower Systems POS software can easily handle package or bundled offers, like the JB Hi Fi 3 for $10 offer they are running for greeting cards. Using our smart small business POS software, retailers can run bundled deals like we see in JB Hi Fi with ease. Small and independent retailers can match the retail giant simply and easily. This is important as offers like this make price comparisons difficult. In addition to bundled offers like this, the Tower software also handled multi buys where shoppers can purchase over time, reaching an award point where they get free product. These facilities are in addition to myriad other discounting options including catalogues, loyalty facilities, discount vouchers and more. All of these tools help small business retailers to be competitive in their offers, competitive against other local businesses, competitive against online and competitive against big businesses, like JB Hi Fi. 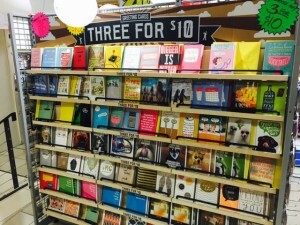 The beauty of offers like the JB Hi Fi offer is shoppers are drawn to the deal of Three cards for $10 and often times purchase one card at a higher margin for the retailer. Our software handles this, kicking in the Three for $10 pricing offer only when the shopper purchases the three cards. This counter management based on volume is easy and automatic – delivering good outcomes for the retailers and ensuing maximum margin. Is the music you play in your retail store right for the retail store? While major chains broadcast in-store radio with ads for what they sell, you can create an oasis in your business that suits your customers and the retail space you create for them. Rather than turning on commercial radio or playing CDs, our suggestion is to sign up for a premium service like Pandora, ideally the ad-free version. Pandora [provides an excellent selection of stations, allowing you to set the mood based on the season or other aspects of what is going on in your business at the time. Using a service like Pandora brings flexibility to the business, it ensures change and helps provide an environment that is more enjoyable and flexible. No music is not good. Commercial radio may be okay in some situations but the ads promote outside your business. CDs need changing and you need a vast library to have a different sound. Pandora, or a similar service, is ideal for i-store small business retail use. This is what we see in plenty of retail businesses now. There is a free version of Pandora, and other services, that you can try before you spend any money on ad-free facilities. The sound of your business can help drive excellent sales for little or no cost. The ever-evolving knowledge based helping users of the Tower Systems POS software is easily accessible, using natural English searches. While the Tower Systems team enhanced knowledge base content, users themselves can provide feedback within knowledge base articles, adding value to the information seeking experience. It is accessible 24/7. It is also referred to in help desk calls as part of the training process and to provide customers with step by step advice on how to do something – if that is appropriate to a specific call. Knowledge base resources include videos as well as text based articles. Indeed, there are more than 100 knowledge base accessible videos. The knowledge base approach by Tower Systems is a good example of the open and interactive approach taken by the company to serving its small business retailer customers. 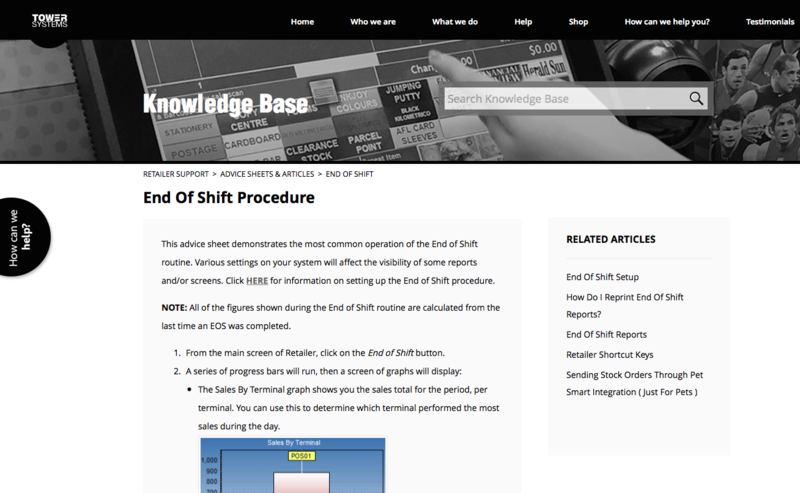 Here is one example one knowledge base article of several on the end of shift process accessible through the Tower Systems POS software knowledge base. The Tower Systems knowledge base can be accessed from any internet connected device including desktop computers, tablets and smartphones. Yes, it is iPhone ready. Meeting Name: How to handle non EDI invoices to keep stock accurate. Date: Thursday 12th of May Time: 2pm Description: See how easy it is to process invoice’s manually for suppliers that do not send electronic invoices to help keep your stock figures accurate. 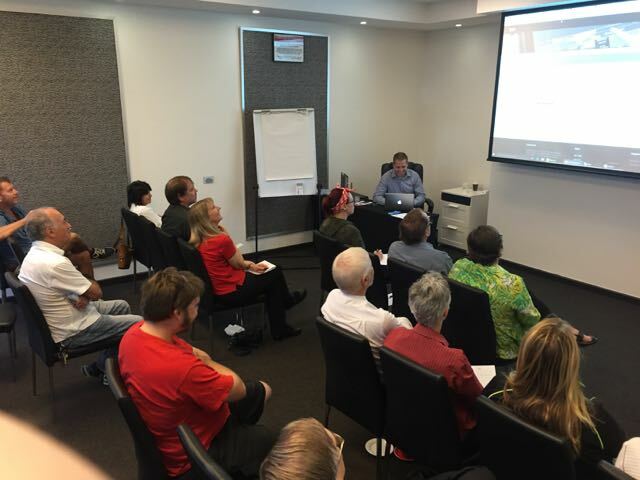 Meeting Name: Getting Ready for EOFY Date: Tuesday 17th of May Time: 2pm Description: Get ready for End of Financial Year now. What you need to do and the reports you need to run. 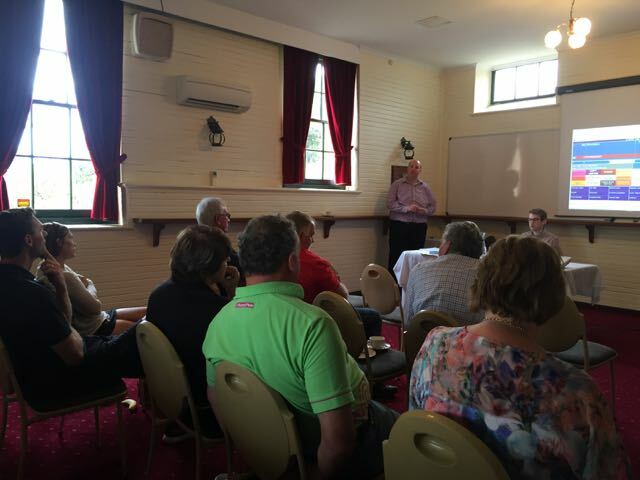 Meeting Name: Stocktaking for EOFY Date: Thursday 26th of May Time: 2pm Description: Doing a stocktake in retailer and what option works best for you. We are grateful to our customers for embracing our free training program. 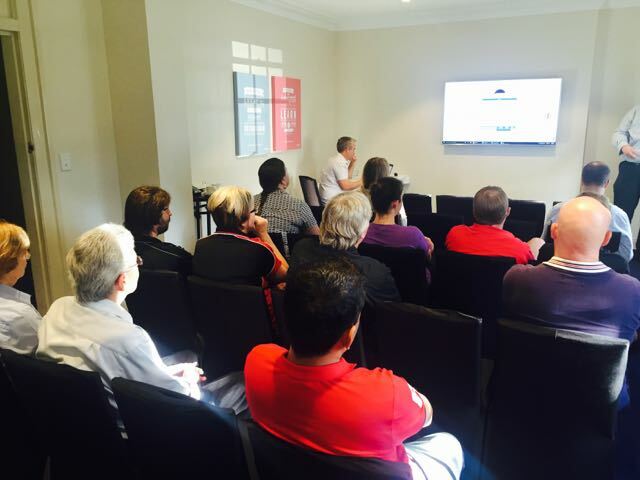 We know those attending training make better users of the software and better retailers. As overseas online businesses compete with local retailers for sales of almost anything, so too do overseas based POS software companies compete with Australian software companies. Here at Tower Systems, we understand local. We understand our local retail business customers. we understand their shoppers. We understand what being local is all about and why it matters to our customers and the communities in which they serve. This is what being local is really about, it is about being knowledgable of and engaged with your local community. Through our POS software and through our customer service we live and breathe the local message. Our actions speak for us through locally focussed software changes and how we serve and connect with our customers. here is a short video explaining our local pitch. This video serves multiple purposes: it speaks to our in-house video production facilities, it has our owner speaking up for us and what we stand for, it shows our commitment to plain speaking anyone can understand and it speaks to our professionalism that you can trust. This is the Tower Advantage, our Tower Advantage, offered to you. 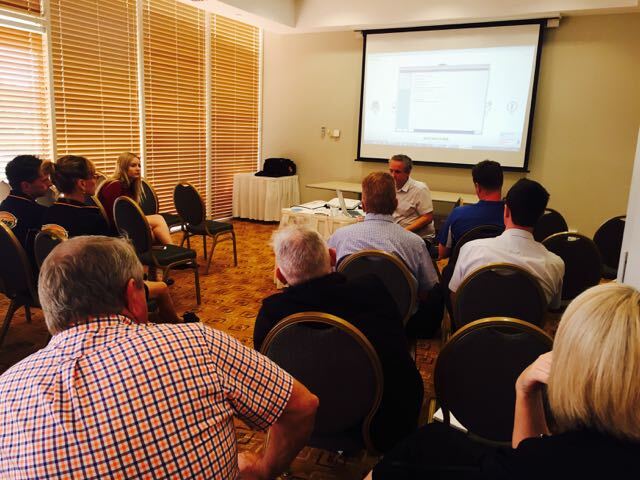 Here are more photos from our recent, in the last six weeks, regional and cap city POS software user meetings for small business retailers. 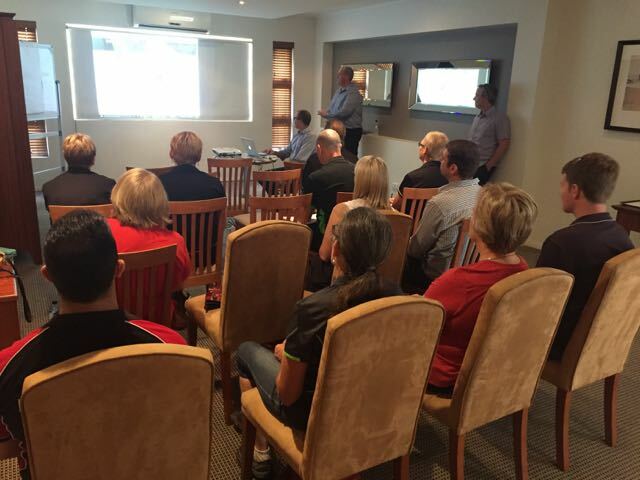 We are thrilled to have met with many engaged and earner to learn retailers. It is one thing to write you have hosted a user meeting and another entirely to show it was real. What Tower Systems has delivered over recent weeks is real: every state, cap cities and major regional centres. And there are more to come. Plus we have our weekly live online workshops for people who cannot get away from their shops. You are an independent Jeweller. In the same way that you need the right tools to craft the clearest diamond, the warmest gold and the sharpest ruby, so you need the right tools to grow your business. You need software that will help you make the most profitable, appropriate business decisions for your circumstances without violating your privacy. Your software should not make these decisions for you: it should help you make them yourself. Our specialty software for jewellers is here to help you. We’ve crafted our software in-house, line by line of code. Just like your jewellery pieces, our software is more than the sum of its parts. It is feature-rich and fast. It is endorsed by hundreds of jewellers across Australia. But what makes it special is the dedication surrounding it: the passion of the team behind it, the culture of Tower Systems. We are small. We have been a vertical-market, specialty retail software developer for thirty-four years and we are proud of it. Being small means being real. We answer the phone when you call. We sell you software directly. We give you our honest opinion. Our software is steeped in this culture: personal service meeting the needs of independent jewellers like yours. You know about jewellery. You don’t need a large software company looking through your business data without your permission. What you need is to be empowered. You need a company on the level with you, an Australian business immersed in the challenges of running an independent business. Tower Systems is that company. We empower you through our software to sell more and sell better. We empower you to create cutting edge business intelligence reports from your data, when you want to. We provide features and functions to help you to perform valuations, manufacture goods, perform stocktakes, sales, catalogues, promotions, customer marketing, to link with a webstore, accounting or payment platform, to customise receipts, send anniversary reminders and more. If our software could perform better for you, we’ve built a community where you can share your ideas and be part of the development process yourself. Straight up, openness. This has led to the development of an industry-leading loyalty facility and business analytics reports based on benchmarks most jewellers do not consider or have access to. We do not hire sales people. Our state based account managers are ex-training & support staff. They are experts. Experts who have worked their way up through the ranks of Tower Systems. They fielded customer phone calls in the support room. They installed computer systems in jewellery stores across the country. They earned their detailed knowledge of the jewellery industry in the field, with hard work and experience. They are the only people who can sell you our software, because product knowledge beats sales technique any day. When a customer buys a watch from you, they initiate a relationship with you. When you buy our specialty POS software, you join our family. We look after you with real support. Every morning our support team – across offices in Melbourne, Sydney and Brisbane – is ready for your phone calls and emails. When you call, they pick up the phone. Tower Systems does not employ robots. We hire real people with diverse experiences. We don’t hire smart-arses: we save our jobs for communicators. Customer support is crucial to empowering your business. You need to know you can rely on your computer system – and if the power goes out or a staff member does something unexpected, you need to be certain we’re here for you. You need to be sure that the company who developed your POS software has your needs at heart. We do. And we’re here to help. When it comes to POS software, small business retailers want an easy life. This means hassle free, straightforward. Key to achieving an easy life with POS software, besides the software itself being easy to use, is the ease with which parts of the software not often used can be learned and understood in the context of business operation. Whereas in the past, a user manual was the key learning tool, today, the key learning tool is a good online, searchable and constantly evolving knowledge base, a knowledge base that keeps up to date with the software, evolving as the software evolves. A good knowledgeable includes how to text, step by step guides and instruction videos. It facilitates access to all these resources from anywhere including mobile, tablet and computer – at work, home and elsewhere. This is what best practice user documentation looks like for smart POS software for small and independent retail businesses. Whereas a printed manual is hard to update and not easily searched, evolving online searchable documentation is different, more useful and more valuable for engaged users who want to achieve more from their software. Yes, the printed manual is so last century. At Tower Systems we provide access to our documentation through a searchable knowledge base. This is setup in such as way so as to make searching easy for non technical people, so they can search based on plain English terms and find what they are looking for. The knowledge base is interactive too, allowing users to add comments and provide feedback. This makes it a customer driven resource and open to two-way communication. Our experience is that small business retailers love the accessibility of the knowledge base and the documentation it contains. Better still, they love the ability to request enhanced coverage on this or that topic and then seeing us deliver this enhanced content. Helping users enjoy easy use of our software is vital to their success and the commercial value of the software. So, to us, good documentation starts with easy to use software. Screen designs, data field descriptors, on-screen information and more combine to make using the software easy. The online documentation through the knowledge base makes it easy to, to learn more about the software. Our approach to POS software user documentation is that the job is never done. Just as our software evolves so does the documentation supporting our software. Produce stores including farm produce stores, stock feed businesses, equine supply businesses and other businesses supplying pet and produce supplies are embracing the Tower Systems Produce Software to get a better handle on many aspects of business management. With so much work being undertaken away from the business base, using software that enables easy tracking while on the road is important, just as tracking requirements by customers for bulk through to single pack shipments. Being able to bring product in by bulk and breaking this down to saleable and deliverable packs is important as produce stores sell to a variety of situations. The Tower software has proven usability in this area of handling multiple pack sizes and easily enabling service of this and other produce business specific requirements. Better still, enabling a seamless link between the Tower Systems Produce Store Software and e-commerce platforms such as Magento and Shopify provides produce businesses with mechanisms for reaching a broader community of shoppers without the usual old-school business overhead. This is particularly useful for produce businesses serving customers who may live in the city and be on the farm on the weekend. There is a certain type of shopper keen for transacting business online. Tower Systems makes it easy for those businesses to connect with the online shopper while at the same time providing tools for serving the needs of the offline shopper, the shopper who prefers personal service. This flexibility in entry points to the business through the software make doing business easy and help produce stores to win more sales from more types of shoppers. Our work in the pet retail space with our Pet Shop Software has leveraged us into the produce store space and the result is good for both retail channels thanks to our approach to business specialisation. Customer accounts, scale integration, hamper facilities, integrated EFTPOS and more enable produce business owners to offer state of the art tools in their businesses to improve customer service and business efficiency. Produce businesses can rely on the Tower Systems software enhancement program to deliver more comprehensive tools as the needs of the marketplace evolve. Tower engages with customers in their businesses to ensure the software evolves to meet their evolving needs.